Map of the watershed of Syr Darya. Aral Sea boundaries are c. 1960. 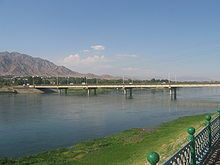 The Syr Darya[a] is a river in Central Asia. It originates in the Tian Shan Mountains in Kyrgyzstan and eastern Uzbekistan and flows for 2,212 kilometres (1,374 mi) west and north-west through Uzbekistan and southern Kazakhstan to the northern remnants of the Aral Sea. It is the northern and eastern of the two main rivers in the endorrheic basin of the Aral Sea, the other being the Amu Darya. In the Soviet era, extensive irrigation projects were constructed around both rivers, diverting their water into farmland and causing, during the post-Soviet era, the virtual disappearance of the Aral Sea, once the world's fourth-largest lake. When the army of Alexander the Great reached the Jaxartes, after travelling through Bactria and Sogdia without encountering any resistance, they were there met with the first instances of native resistance to their presence. Alexander was wounded in the fighting that ensued and the native tribes took to massacring the Macedonian garrisons stationed in their towns. As the revolt against Alexander intensified it spread through Sogdia, plunging Sogdia into two years of warfare, the intensity of which surpassed any other conflict of the Anabasis Alexandri. It was on the shores of the Syr Darya that Alexander placed a garrison in the City of Cyrus (Cyropolis in Greek), which he then renamed after himself Alexandria Eschate – "the farthest Alexandria"—in 329 BC. For most of its history since at least the Muslim Conquest of Central Asia, the name of this city has been Khujand (in Tajikistan). During the Russian conquest of Turkestan in the middle 19th century, the Russian Empire introduced steam navigation to the Syr Darya, with an important river port at Kazalinsk (Kazaly) from 1847 to 1882, when service ceased. 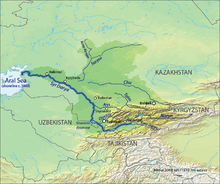 During the Soviet Era, a resource-sharing system was instated in which Kyrgyzstan and Tajikistan shared water originating from the Amu Darya and Syr Darya rivers with Kazakhstan, Turkmenistan, and Uzbekistan in summer. In return, Kyrgyzstan and Tajikistan received Kazakh, Turkmen, and Uzbek coal, gas, and electricity in winter. After the fall of the Soviet Union this system disintegrated and the Central Asian nations have failed to reinstate it. Inadequate infrastructure, poor water management, and outdated irrigation methods all exacerbate the issue. The river rises in two headstreams in the Tian Shan Mountains in Kyrgyzstan and eastern Uzbekistan—the Naryn River and the Kara Darya which come together in the Uzbek part of the Fergana Valley—and flows for some 2,212 kilometres (1,374 mi) west and north-west through Uzbekistan and southern Kazakhstan to the remains of the Aral Sea. 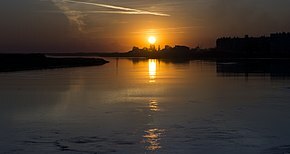 The Syr Darya drains an area of over 800,000 square kilometres (310,000 sq mi), but no more than 200,000 square kilometres (77,000 sq mi) actually contribute significant flow to the river: indeed, two of the largest rivers in its basin, the Talas and the Chu, dry up before reaching it. Its annual flow is a very modest  37 cubic kilometres (30,000,000 acre⋅ft) per year—half that of its sister river, the Amu Darya. Along its course, the Syr Darya irrigates the most productive cotton-growing region in the whole of Central Asia, together with the towns of Kokand, Khujand, Kyzylorda and Turkestan. Various local governments throughout history have built and maintained an extensive system of canals. These canals are of central importance in this arid region. Many fell into disuse in the 17th and early 18th century, but the Khanate of Kokand rebuilt many in the 19th century, primarily along the Upper and Middle Syr Darya. The second part of the name (Darya دریا) means "sea" in Persian. The current name dates only from the 18th century. The earliest recorded name was Jaxartes /ˌdʒæɡˈzɑːrtiːz/ or Iaxartes /ˌaɪ.əɡˈzɑːrtiːz/ (Ἰαξάρτης) in Ancient Greek, found in several sources, including those relating to Alexander the Great. The Greek name hearkens back to the Old Persian name Yakhsha Arta ("True Pearl"), perhaps a reference to the color of its glacially-fed water. More evidence for the Persian etymology comes from the river's Turkic name up to the time of the Arab conquest, the Yinchu, or "Pearl river". Following the Muslim conquest, the river appears in the sources uniformly as the Seyhun (سيحون), one of the four rivers flowing from the Paradise (Jannah in Arabic). The current local name of the river, Syr (Sïr), does not appear before the 16th century. In the 17th century, Abu al-Ghazi Bahadur Khan, historian and ruler of Khiva, called the Aral Sea the "Sea of Sïr," or Sïr Tengizi. Massive expansion of irrigation canals in Middle and Lower Syr Darya during the Soviet period to water cotton and rice fields caused ecological damage to the area. The amount of water taken from the river was such that in some periods of the year, no water at all reaches the Aral Sea, similar to the Amu Darya situation in Uzbekistan and Turkmenistan. The uranium concentration of the stream water is increased in Tajikistan with values of 43 μg/l and 12 μg/l; the WHO guideline value for drinking water of 30 μg/l is partly exceeded. The main input of uranium occurs upstream in Uzbekistan and Kyrgyzstan. ^ a b Daene C. McKinney. "Cooperative Management of Transboundary Water Resources in Central Asia" (PDF). Ce.utexas.edu. Retrieved 2014-02-07. ^ "Lesser Aral Sea and Delta of the Syrdarya River". Ramsar Sites Information Service. Retrieved 25 April 2018. ^ Also transliterated Syrdarya or Sirdaryo. ^ Holt, Frank Lee (1989). Alexander the Great and Bactria: The Formation of a Greek Frontier in Central Asia. Brill. p. 53. Retrieved 31 March 2019. ^ International Crisis Group. "Water Pressures in Central Asia", CrisisGroup.org. 11 September 2014. Retrieved 6 October 2014. ^ "Sïr Daryā." Encyclopaedia of Islam, Second Edition. Edited by: P. Bearman, Th. Bianquis, C.E. Bosworth, E. van Donzel, W.P. Heinrichs. Brill Online, 2014. ^ P. Zoriy, M. Schläger, K. Murtazaev, J. Pillath, M. Zoriy, B. Heuel-Fabianek (2017): ' Monitoring of uranium concentrations in water samples collected near potentially hazardous objects in North-West Tajikistan.. Journal of Environmental Radioactivity, 181, pp. 109-117. Wikimedia Commons has media related to Syr Darya.